Posh chairman Darragh MacAnthony (left) and manager Grant McCann. Peterborough United chairman Darragh MacAnthony is disappointed with the flak manager Grant McCann has received from some fans this season. The club owner stated during his exclusive, wide-ranging interview with the Peterborough Telegraph that McCann’s job will only be under threat if Posh don’t look like challenging for promotion from League One next season. Lee Glover was sacaked as Posh assistant manager for failing to improve the club's forwards. But MacAnthony is confident his rookie boss will learn from mistakes made in his debut season and rise to the challenge of getting Posh back into the Championship. MacAnthony also lifted the lid on the sacking of assistant manager Lee Glover last month. Former Posh player David Oldfield is now assisting McCann until the end of this season on a trial basis. “We have a rookie manager who some fans want me to fire,” MacAnthony moaned. “I find this disappointing. If people want to hate or criticise, then they should aim there fire at me, not a 36 year-old just starting out as a manager. Grant McCann can become assuccessful as former Posh boss Darren Ferguson according to chairman Darragh MacAnthony. “Believe me Grant has serious talent, serious potential. He’s dealt with massive problems (not from me!) 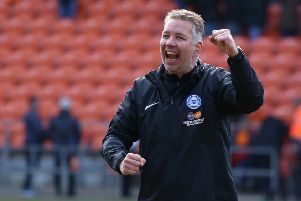 this season, the sort that Darren Ferguson never experienced. And he’s handled everything with more class and composure than I expected. There was a time when I thought he might go into meltdown and give it all up, but he’s a strong and determined man. He has the minerals for this job. He is up for the challenge and I believe he will succeed. “We went to the Football League awards last weekend and Grant was seething at other managers going on stage to collect an award. He has a healthy envy. He wanted to be picking up prizes on behalf of our club. “I have a great relationship with Grant. I speak to him more than I used to speak to Fergie. We don’t always agree, but he wants to learn, his work ethic is strong and I believe he will become a top boss. “But he understands football and he knows he must get results. If we get to January next season and we have no chance of going up, he knows what will happen, but I don’t think it will come to that. “You don’t hire a rookie and fire him before the end of his first season. You support him and then you support him again. If we win our final games and get into the top eight I’d give him a 7/10 for his first season. “I won’t compare his management to Fergie, but he can become just as successful. I will get Grant experienced help next season. It’s something we tried to sort out for this season, but we went with Lee Glover as Grant knew him from his coaching courses. “It didn’t work out with Lee. He is an ex-striker with responsibility to coach our forwards, but they weren’t improving so I made the decision to let him go. We’d won five of our last 20 matches at the time which would normally lead to a manager leaving, but I didn’t want that to happen. “Grant didn’t approve because he is a loyal man, but it was something I needed to do to shake up the dressing room. “If it’s the manager dishing out the rollockings all the time, the players stop listening. We needed Lee to step up and help Grant in that area.